Why is it that when we as women hear the word modesty we instantly get this funny uncomfortable feeling in our gut? I think we automatically go right to envisioning our shirts buttoned all the way up to our chin, we see our skirt touching the tip of our shoes, and we see our hair pinned up in a bun, with no makeup and jewelry no where to be found. My little disclaimer: I am not writing this to point an accusing finger. I am not the world’s new appointed fashion police. I have had the question about modesty come up a few times, so I’m writing this in hopes of giving exhortation: the giving of earnest advice or encouragement. I believe all of God’s Word is meant to guide us into all truth, and Jesus said He would send a helper (the Holy Spirit) to help guide us into this truth (John 14:26). Jesus did not come into the world to condemn the world, but He came to save the world-all who would believe in Him (John 3:17). Satan brings shame not Jesus.We are free in Christ. 1. First off, we need to know how fearfully and wonderfully made we are. In Psalms 139, God tells us that all our days were fashioned for us, when as of yet there were none of them. God know every hair on our head. He knows every imperfect blemish that is on our body, and He loves us. We have to stop letting the world determine what is beautiful and acceptable. God gave us everything that we have…..body type, hair color, skin color, height, and personality. We don’t have to masquerade around pretending to be someone else. A strong woman is someone who can be who God created her to be. 2. Now, let me just jump right in this one…. My sister in Christ, we can be either used to build up the godly men around us or we can be used as a stumbling block. We know we are wonderfully made, we don’t have to flaunt all our stuff around trying to get attention.The men in our church and around us struggle with this all the time, and it is bad enough that it is plastered all over media and the highways. Does it have to be their sisters in Christ causing them to stumble? And by the way, there is certain clothing to be worn in front of our husbands. But other women’s husbands and sons don’t need to be seeing it. And I must add, this would include the things we post on social media, too. 3. As moms and older mature women of God, training our daughters and other girls is a privilege we have. As I think about it, I can’t think of many women who were stirring me in the right direction as a little girl and young woman. Now that I have my own daughter, I take the job of raising her very seriously. If we as Christ professing women don’t take our walk seriously, how can we expect our daughters and generations ahead of us to. Teach your daughters what is appropriate, set boundaries on what you will allow them to wear and not wear. Here is a tip….if you don’t want your daughter wearing certain clothes at 13, don’t put her in it at the age 3. Be the example in your own dressing attire and conduct….while at the same time allowing them the freedom to be who God created them to be, which is a unique, beautiful child who He has great purpose for. 4. Lastly, knowing our value in Christ goes along way in walking with true confidence as women of God. I truly believe our creator cares about our insides a lot more than our outsides; however, what is going on in the inside is often displayed on the outside. Like I stated already, I am not walking around with a comparison stick trying to set a list of rules. I think we as women have enough of that. We need to love each other and encourage one another to pursue Christ in every stage of our journey. He is the only one who can transform lives. 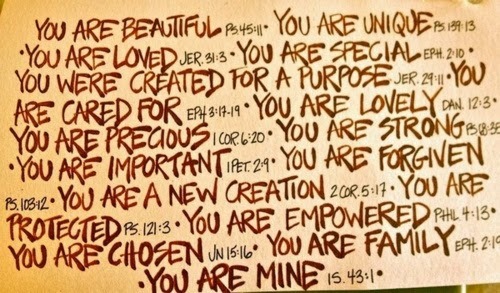 I am personally so glad that Jesus loves me just the way that I am. I am beautiful in His sight, and I can take pleasure in glorifying Him. I am glad I don’t have to be perfect, because He is. I can seek Him in every walk of my life. Do not let your adornment be merely outward-arranging the hair, wearing gold or putting on fine apparel-rather let it be the hidden person of the heart, with the incorruptible beauty of a gentle and quiet spirit, which is very precious in the sight of God.